My introduction to the music of Patrick Larley came when he sent two CDs to me following my review of the choral music of Margaret Wegener. see review. His music is in the lyrical tradition rounded by the natural rise and fall of the human voice and by the English language. Larley was born in Frodsham, Cheshire in 1951. After study at the Royal Manchester College of Music he pursued a cathedral career as organist and choral director. He is now a freelance composer, conductor, harpsichordist and organist living in a small village in North Wales. 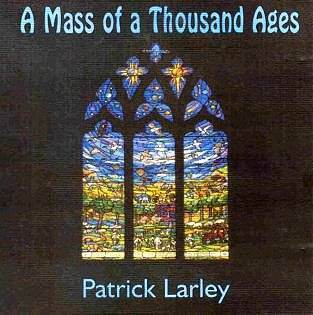 This recording of Larley's Mass was taken down from the premiere. There are the usual complement of coughs, shuffling and rustling. It all adds to the ambience - nothing deleterious. This Mass, written for the Millennium, mingles traditional Latin elements with English poetry. The style is rootedly tonal yet keenly inventive. In the Kyrie the style reminded me of that of another composer from North Wales: the late William Mathias. Mathias's outstanding cantata This Worlde's Joie for soloists, adults� choirs, children's choirs and a very full orchestra. The spangled splendour of that work can be heard here too. This is more a matter of kinship than replication. The vocal style for the choirs is pretty catholic with sprechgesang, whispers and rustles and much direct singing. In addition there is a surging and plunging role for the organ as well as one of gentle supplication. The music in the Credo picks up on the optimistic charge to be found in the choral works of Geoffrey Bush (his superb cantata Summer Serenade), John Rutter and Leonard Bernstein. I loved the bubbling woodwind writing. The life-enhancing syncopation (echoes of Constant Lambert) to be found in some of Larley�s songs also comes across in the Credo and towards the end of the Agnus Dei. Throughout the six separately tracked panels of the Mass, each of which falls into pause-separated segments, there is also a reaching back across the Thousand Ages of the Title to ancient and medieval times. The sense of time-travel adds greatly to the experience of this fine cantata which stands in the long tradition of anthology-based masterworks including Bliss's Beatitudes and Morning Heroes, Vaughan Williams' Dona Nobis Pacem and Hodie as well as Britten's Spring Symphony. There is the occasional mishap but these are transient issues which do not detract. Listen to the Sanctus and Hosanna with their wondrously young-sounding children's choir as it confers blessing like a cooling breath over a world frantic with gaining and losing; spending and knowing. I strongly commend this major piece of writing. Do seek out this CD. I have given enough clues to help you decide whether you would like it. Choral societies and directors looking for a major statement with which to keep faith with audiences dry for music that offers accessible and mystical intercession should not hesitate. Let's look out for more music by Mr Larley.